…to the rotating jaw ring 4. …and a crowded circle of balls 7 located by a step on the hub. The release torque settings are made by adjusting the control ring 9 so altering the spring forces. 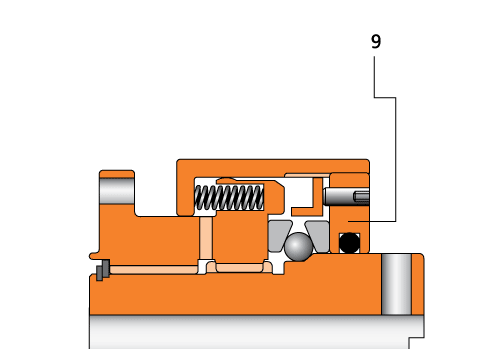 The adjusting ring is locked in position by a set screw 8. The clutch can be installed in any drive system, safeguarding against sudden surges or gradual build-up of torque. Modifications are possible to provide manual lever operation of the clutch while retaining the overload release feature. Single direction release and one position reset can also be provided. The drive is transmitted from the hub 1 through the splined ring 2 via the tapered jaws 3 to the rotating jaw ring 4. The jaws are held together by spring pressure acting through two angled races (5 and 6) and a crowded circle of balls 7 located by a step on the hub. 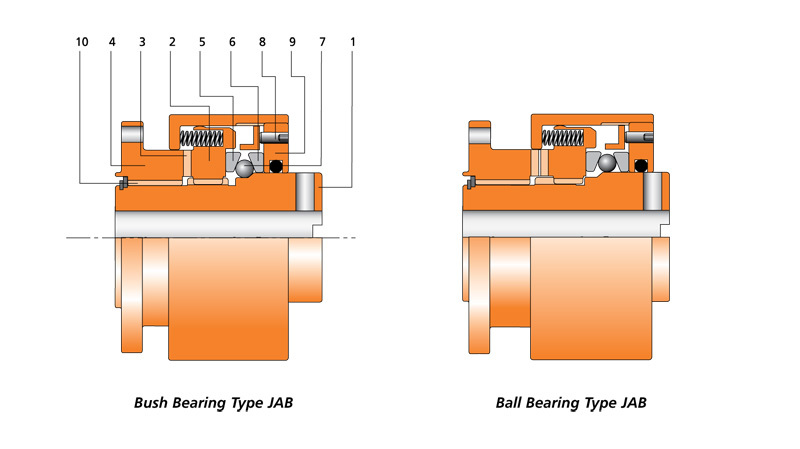 On overload, the tapered jaws are thrust apart, moving the splined ring 2 and lifting the balls 7 over the step on the hub, thus instantly disengaging the drive, leaving rotating jaw ring 4 free to rotate on bearing 10. The release torque settings are made by adjusting the control ring 9 so altering the spring forces. The adjusting ring is locked in position by a set screw 8. To re-engage, the tapered jaws are aligned using reference marks and the sliding assembly pushed along the hub until the balls snap back into their original position. This requires no further spring compression and is easily accomplished. For remote resetting the body can be supplied with a flange to suit a resetting mechanism. See diagram below. Clutches can be supplied pilot bored or finish bored and keywayed. The hub may be fitted to either shaft and the flange can be connected to a flexible coupling or can carry a sprocket or pulley. Typical arrangement of Type JAS fitted with shifter ring which can also be optionally used to operate a limit switch. For particularly dusty conditions such as cement works we offer neoprene seals. Please specify when ordering. Important – Use switch plate and limit switch to quickly shut down drive on break-out to avoid damage to bearing. For prolonged periods of running disengaged, ball-bearing mounted units must be used. For higher speed applications consult Brunel Corporation.